Leonardo’s endless curiosity regarding the form and function of all natural phenomena is attested to in his drawings, manuscripts and paintings. As nature could only be understood by direct “experience” or engagement with real life models, man, plants, animals, and the world that they inhabited became the subject of intense scrutiny in the quest for understanding of all natural things. The ancient analogy between the body of the world and the body of man features frequently in Leonardo’s notes, particularly in relation to the role of water in the life of the world. 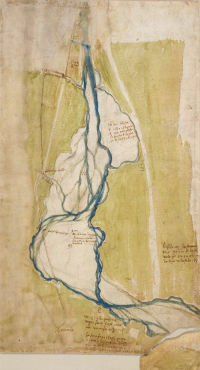 This carefully drawn and coloured map shows the stretch of the river Arno immediately to the west of Florence. In Leonardo’s bird’s-eye vision, the waters of the Arno course through the body of the earth just as veins run throughout the human body. Tiny dots visible within two parting streams of the Arno towards the upper centre of the drawing, represent sediment deposits laid down by the river at the mouth of the tributary. This consideration of the effects of erosion and deposition on the flow of the river calls to mind Leonardo’s study of the superficial veins of the left arm of a young and an old man. The “silting” up of the veins is seen as the result of the same natural processes, which are a consequence of the ageing process and ultimately the cause of death in the case of an elderly man. The idea appeals to me that the earth is governed by nature and is much like the system of our own bodies in which there are both veins (vessels for blood) and arteries (vessels for air). In the earth there are some routes though which water runs, some through which air passes. And nature fashions these routes so like the human body that our ancestors call them “veins of water”. This carefully drawn and coloured map shows the stretch of the river Arno immediately to the west of Florence - the key area in the Florentine Republic’s efforts to make the Arno a navigable waterway connecting Florence to the sea. In Leonardo’s bird’s-eye vision, the waters of the Arno course through the living body of the earth just as veins run throughout the human body. Tiny dots visible within two parting streams of the Arno, towards the upper centre of the drawing, represent sediment deposits laid down by the river at the mouth of the tributary. © University of the Arts, London 2019. All rights reserved.